As a working adult, birthdays are now just another day spent at the office. 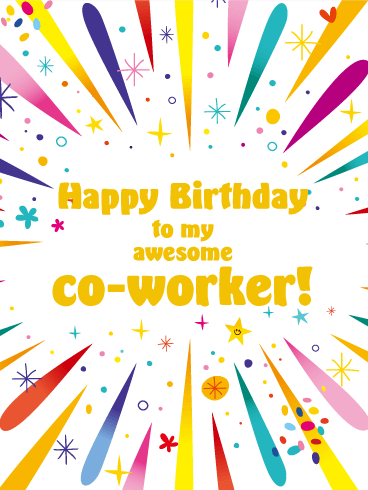 Though birthdays may not be as great as they were as a kid, celebrating with co-workers can add extra excitement and fun to these special days. 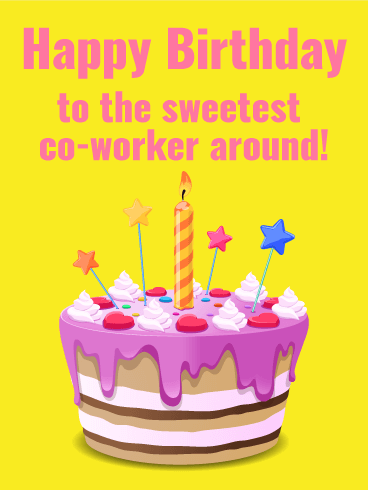 For your co-worker's birthday, use this Happy Birthday card to show them how much you care! 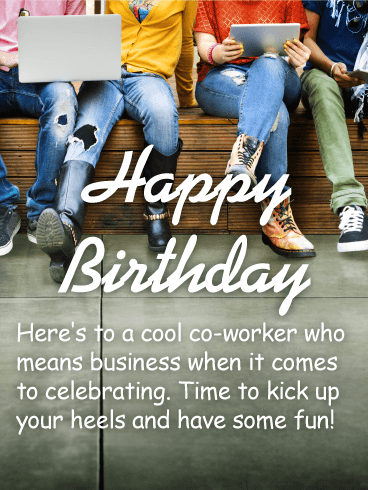 Make birthdays in the workplace a little more exciting with this fun birthday card! WOOHOO! 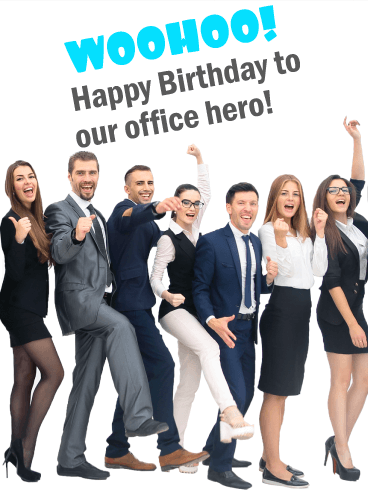 Happy Birthday to our office hero! 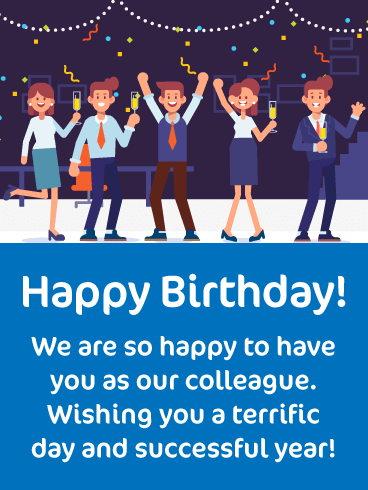 If you know a colleague who is celebrating their birthday today, then make sure to send a greeting card to show how much you appreciate them. This fantastic birthday card will brighten their day when they read that you are happy to have them as a colleague! They will also appreciate the great illustration of colleagues celebrating together. 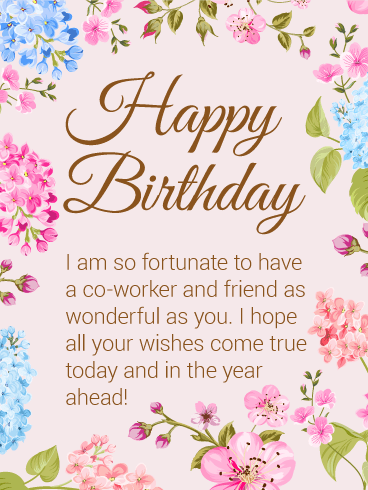 Send this wonderful birthday card out today to wish them a terrific day! 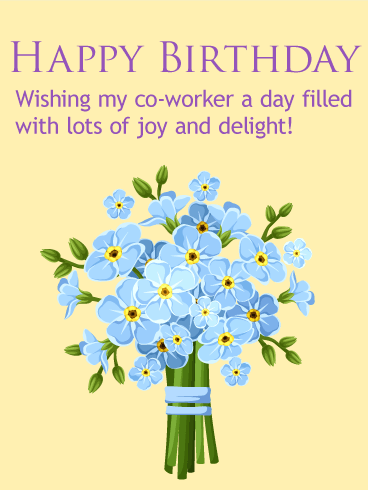 A pretty blue bouquet of flowers brings a beautiful touch to this birthday card for a special coworker. They've become an important part of every day as someone you work with, but also as a friend. This is a wonderful choice for reminding them how much they are appreciated. This bright, fun birthday card is the perfect choice to send to a coworker who's incredibly sweet! 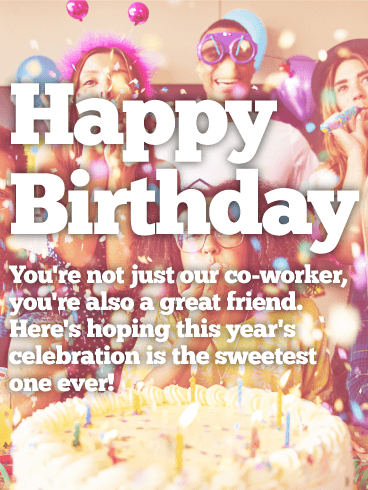 Whether it's from one person or everyone in the office, receiving it is sure to be the best part of their day because they'll know someone took the time to help them celebrate! 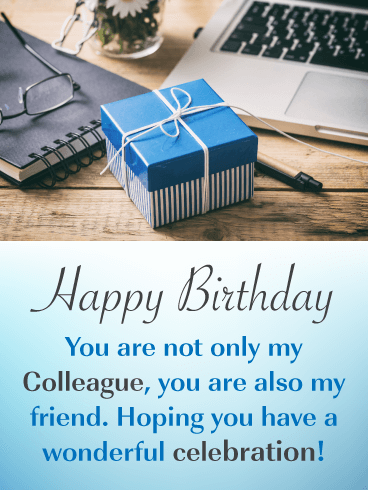 Give a special co-worker in your office a reason to smile on their birthday when you send them this touching birthday card. A cluster of flowers adds a lovely touch to the simple yet sweet greeting right above, which gives you an opportunity to wish them "all the success and happiness in the world!" We work with many different people throughout our lives, but it's not often we find someone we can truly call a friend. This birthday card is a beautiful way to let a special co-worker know you're wishing them a happy birthday. Flourishes of pretty pastel flowers peek out from all around while at the center, your heartfelt words are a reminder of how much you appreciate them. Bright balloons floating above. A special wish below. 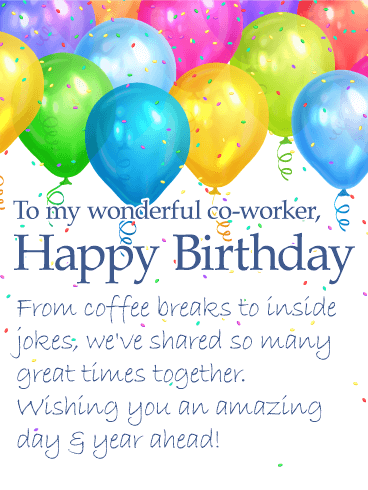 That's the best way to say "Happy Birthday" to a wonderful co-worker! You see them every day, working side by side and sharing lots of fun moments. 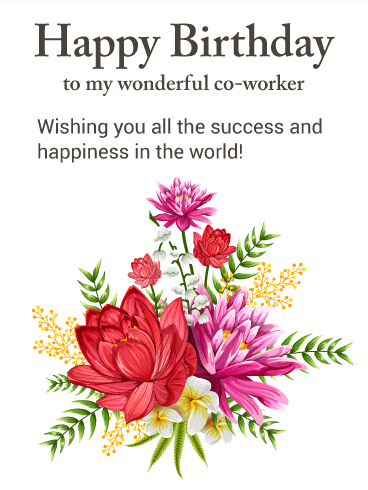 This birthday card will remind them how much you appreciate having them in the office not only as a part of the team, but also as a friend. You know that co-worker in the office who's become a great friend? When their birthday comes around, help them celebrate with this festive birthday card! A delicious-looking cake, complete with bright candles on top, and glasses of Champagne all around, is the best way to toast the person who makes being at work feel less like a job and more like a party! Everyone loves celebrating an office birthday. It's a chance to take a break and share some conversation and laughter with co-workers, while getting a little extra sugar rush from all the sweet treats! This birthday card is perfect to send from the entire group as a way to let someone awesome know that they're appreciated and remembered. It will be the best email they get all day! This is the perfect card for a cool coworker who's celebrating a birthday. It's a reminder that no matter how busy work gets, there's always time to have a little fun! Whether it's sent from a few people or the whole group, help celebrate their big day in style by choosing a card to match their colorful personality! Even work can wait when there's a birthday to be celebrated! 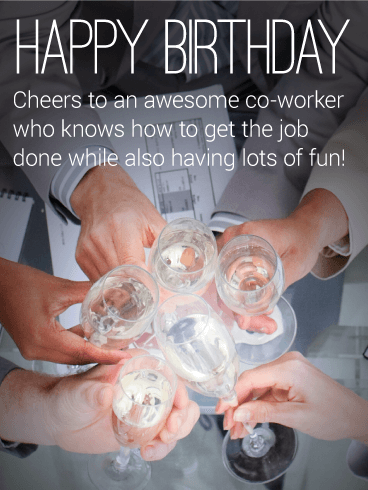 Help raise a toast to an amazing co-worker with this fun birthday card, which is the perfect pick for the whole crew to send. Not only will it let them know you remembered, but it will also put them in the mood for an after-work party with all the people that make coming to work so much better! Everyone loves feeling remembered on their birthday. And this bright, festive birthday card is sure to make an awesome co-worker look forward to turning another year older! Cheerful bursts of color surround a bold "Happy Birthday" greeting to your office buddy. Whether it's from one person or the whole group, this is one wish they'll always remember.